Peter Thompson almost messed up his transfer to Liverpool - LFChistory - Stats galore for Liverpool FC! Peter Thompson was the great schoolboy star of his day and was pursued by seventeen clubs when the time came to leave school. Thompson became a regular First division player at 17 for Preston. He attracted attention of bigger clubs and Preston even turned down a bid from Juventus. After 122 league games and 20 league goals for Preston and relegation to 2nd division after only one season for the youngster in the top-flight he moved to Liverpool for 37,000 pounds. The youngster almost messed up his transfer to Liverpool when he joined on 14 August 1963. "I had a friend whose father was a coach at Preston and he told me to ask for signing-on fee. It was illegal at the time, but I knew a lot of players who’d got one." Shanks didn’t take to Peter’s request kindly: ‘I am giving you the chance to play for the greatest team in the greatest city in front of the greatest fans and you want illegal money.’ Shankly turned to club chairman T.V. Williams and sneered: ‘I don’t want him. There’s a flaw in his character.’ Thompson insisted he was only kidding and a tense moment followed and nervy silence ensued before Shankly replied: ‘You’re a brave man asking me for extra money’. 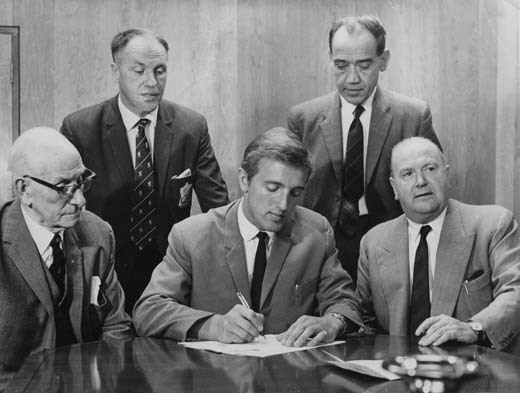 Shanks then handed the contract for Peter to sign. Thompson was relieved: "My whole body was shaking and I couldn’t sign quick enough. I never got signing-on fee, but I was so relieved just to have completed the move in the end." Thompson was a brilliant right-footed left winger, who tormented full-backs. He went straight into the first-team and played in all 42 league games in his first season, thus winning a championship medal as Liverpool won the title by 4 points from Manchester United. Peter was an important member of the side which dominated domestic football in the mid-60's, winning another championship medal in 1966 as well being part of the first Liverpool team to win the FA Cup the year before. The wonder winger continued to torment defenders until the end of the decade but even though he was not yet 30 years old, he no longer had the pace of his younger days even though his skill was never in doubt. Knee trouble forced him to leave Anfield prematurely, as when he had finally recovered he still played 117 league matches for Bolton.